Tools with a blade that are used for woodworking or other tasks need to be sharpened regularly, This is something you can do by hand or by using a machine. The only downside is the work is often manual as you need to use a sharpening stone or hold the tool when using a machine. One solution to help keep you from sharpening tools manually is to build a powered sharpening system. A powered sharpening system is a great way to restore a sharp edge to many types of tools. This includes chisels, knives, and many others. Most people who work with these tools every day know that any dull tool will not produce the results that are desired. 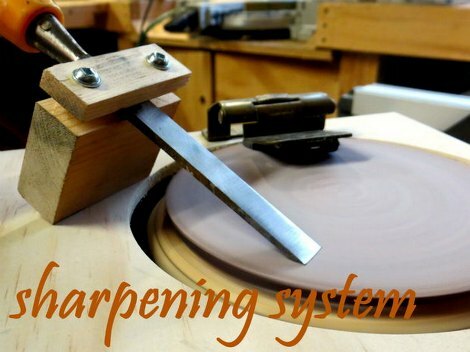 If you do not have the time to manually sharpen hand tools, then a powered sharpening system will be ideal. The best way to sharpen tools is to use a sharpening stone or grinder. However, you can use nearly any type of abrasive material to sharpen tools. This includes a gritty sandpaper. The main thing to realize is the movement of the abrasive for you powered sharpening system when a tool is applied. All you need to do is find the parts that are needed for this project. A good motor is required as this is the heart of your powered sharpening system. The goal is to make a machine that is similar to a record player. Your powered sharpening system needs to turn to restore the sharpness to your tools. If you add the right type of motor, then an on/off switch can be used. There are many details to keep in mind when sharpening tools. This means you will need to determine if there are any extra options you need to include for your powered sharpening system. One detail which is important is the enclosure for the motor unit.